« First plates of Sevilla! Julia and I are going to Paris tomorrow morning! We are spontaneously visiting our friend Joanna, who has an internship and an apartment right in the heart of the city. As I might be out of touch for several days, I’ll leave with this pic I snapped outside of the Cathedral. 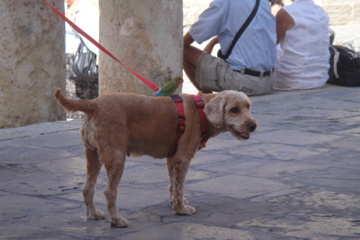 Walking dog and bird at once- and they say Americans are workaholic multi-taskers!